Dancers' Turnout — Dance. Search. Blossom. Turnout is a factor that has an impact in dancers’ everyday practice. Still, there are many misconceptions surrounding turnout. Turnout is defined by one’s individual structure, and several anatomical factors affect it. Research has given information of the relationship between forcing turnout and injuries, but also about improving turnout safely. In this post, the factors affecting one’s turnout will be explained. Also, turnout’s connection to injuries will be discussed with some considerations for improving turnout safely. What affects turnout in dance? The depth and direction of the acetabulum, and the length and direction of the femoral head have an impact on turnout. The direction of the neck of the femur may be naturally forward (‘anteversion’) which will be shown as smaller turnout. If the direction is naturally backwards (‘retroversion’) this would be shown as greater turnout. Also, the natural twist of the shin bone (tibia) has an impact in turnout – either it makes the turnout look greater if twisted laterally, or lesser if twisted medially. This of course only if the turnout is measured from feet; the structure of the shin bone does not have an impact in turnout if it is measured from the hip joint e.g. with the dancer lying on his/her back. The twist of the shin bone is called ‘tibial torsion’. It simply means that the highest point of your shin bone (right below your kneecap) may point to different direction than the lowest point of it. When standing in parallel, your feet may point outwards, and when forcing them to parallel you might feel like they are internally rotated. This tibial rotation is completely normal – it is just another factor that has an impact on the turnout you stand on. Growth causes natural changes in the bony structures and intensive dance practice may have an impact in the skeleton in childhood and in adolescents. The hip joint is supported by strong connective tissues (ligaments). Their purpose is to support and stabilise the joints, so it is absolutely not recommended to try and stretch the ligaments as they are not capable to recover from the stretch. With stretching, ligaments’ ability to support the joints will weaken which predisposes the dancer to future injuries. Ligaments will start to elogate when staying long periods of time in a maximal stretch. Read more of stretching from the previous post. Photo: Oonasofia Saukkonen. Ballet isn't the only dance style where turnout is used, although in ballet the role of turnout is of course emphasised. The ligament that most restricts the turnout in the hip joint is the Y-ligament, or iliofemoral ligament. It is located in the front of the hip joint and is called the Y-ligament due to its shape. It is the strongest ligament in the human body and for a reason. The hip joint needs extremely good support in carrying the body weight, in walking, let alone in dancing. Turnout will also be affected by each individual’s ‘ligament laxity’ - the looseness or stiffness of the ligament. Finally, the muscles and their strength and flexibility have an impact on one’s turnout. Simply put, the turnout muscles should be strong and the inward rotator muscles flexible. However, your training should be versatile! It’s good to remember that also the inward rotators contribute to turnout, and that the muscles will not function optimally if only offered stretching or strengthening. The training should be diverse and all the muscles surrounding the hip should be both strengthened and stretched (no prolonged stretches) for their optimal functioning. Of the idealised turnout (90°/leg) approximately 60°-70° is created by the hip joint and approximately 10°-35° from structures below the hip. When one’s natural capacity and strength don’t allow the 180° of turnout, dancers often force more turnout from the knee joint and the foot and ankle complex. 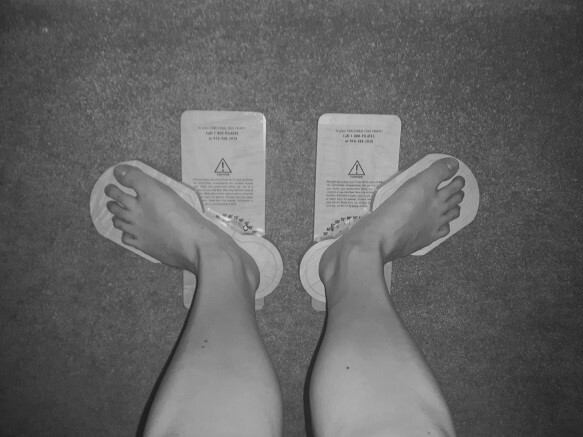 It is possible to utilise the friction of the floor to anchor one’s feet to the floor and thus to achieve visibly greater turnout – even if with muscular strength one would not be able to maintain that turnout. Often in movement, e.g. when rising to relevé, the turnout of the supporting leg decreases. 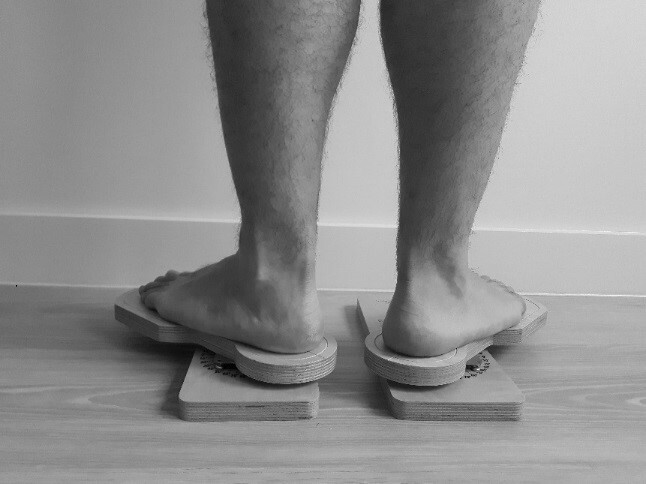 In relevé, utilising the friction between the feet and the floor becomes more difficult also making maintaining the turnout more difficult if there is not enough strength to maintain it. While the knee and the ankle allow small amount of external rotation, they are not designed for that. As turnout is forced over the natural capacity of one’s hip, the medial longitudinal arches of the feet roll in (pronation), and the hip tilts forward, often seen as a sway back posture. Tremendous rotational forces are applied to the joints, exposing them to unfavourable stress. Turnout performed with bad technique causes further problems in the posture throughout the dancing body. This can have a negative impact on the development of one’s dance technique and the ability to perform the movements correctly. Research has shown there to be a connection between forcing turnout and injuries – specifically overuse injuries. When training in an unfavourable alignment the joints are loaded in a way that may result in future injuries. The most typical injuries in dancers are located in the lower limbs, hips, and lower back, and dancers get injured approximately once a year (this of course depends on the dance style in question; e.g. flamenco, break dance, and ballet burden the body in very different ways). The connection between turnout and injuries has been researched and a significant connection between forcing turnout and overuse injuries has been found. To make turnout seem greater dancers often tilt their pelvis forward (sway back). This gives more space for the hip joint to move as the ligaments supporting the joint slacken. This causes stress in the lower back. When forcing turnout, the dancers’ feet can be seen to roll in (pronate) as the medial longitudinal arch of the foot drops on the floor. With time, this can cause the surrounding muscles and connective tissue to become looser. The support and stability of the ankle will decrease which will predispose the dancer to further injuries. The pronation of the foot in forced turnout has also been found to be related to derivation of e.g. bunions and plantar fasciitis (degeneration/inflammation of the fibrous tissue along the bottom of the foot). Forcing turnout causes great torque in the knee joint. Dancers often set their feet on the floor in plié where the ligaments of the knee are looser and allow external rotation to happen in the knee. As the knees are extended, the ligaments become taut again and a great stress is caused to the medial structures of the knee. The medial collateral ligament and the muscles attaching to the medial side of the knee are stretched and a great pressure is addressed to the medial meniscus of the knee. A continuous load of this kind can cause permanent changes in the knee structures which may have an impact even on the gate pattern of a dancer thus causing problems even outside the dance studios. Also, when forcing turnout, dancers cannot deliver their optimal nor technically steady performance. Forcing turnout causes compensations throughout the body which makes controlling the movement difficult. It is good to remember that measuring turnout passively (relaxed, assisted by other person) is not comparable with active turnout (turnout you are able to perform actively with muscle force). If turnout measures (internal/external) are taken e.g. in your dance class, remember that the passive turnout is not the whole truth. It would be more recommendable to focus on measuring and improving the active turnout – that is what you can achieve and maintain while dancing. Photo: Oonasofia Saukkonen. Measuring active turnout with Functional Footprints. Similarly, you could measure active turnout e.g. on rotational discs used in Pilates, but there you would have to measure the degrees separately. Lying on your back, active turnout can be measured using a goniometer but if doing this the person measuring has to be capable to recognise the anatomical landmarks for the result to be reliable. Research suggests that turnout can be improved with targeted training - safely. It would be important to try and gain strength to maintain the turnout one is able to perform actively. The turnout you use while dancing can be called ‘functional turnout’. This could be said to be the most important component of turnout; when dancing, you rarely need to use turnout lying on your back or standing still. Most often dancer will use his/her turnout in motion. Trying to improve turnout by stretching the connective tissue the stability of the hip will be compromised and the turnout muscles may eventually weaken. In the long run, the risk of getting injured grows. Turnout muscles, as any other muscle, can be strengthened. When improving turnout by strengthening the muscles, also the stability of your hip improves, meaning the joint is better supported. Also, it is important to remember stretching the muscles surrounding the hip joint – again bearing in mind to target the stretch to the muscles, not the ligaments (no prolonged stretches). Behind the link, there are tips for both strengthening and stretching the turnout muscles. Once more, if you wish to read more about stretching, take a look at the previous post here. Remember, versatile training for the whole body is the key! Focusing only on turnout muscles will not give you optimal results – but the opposite. Unbalanced training may result in having problems elsewhere in your body. Do strengthen your body comprehensively! Hope you enjoy your training! Allen, N., Nevill, A., Brooks, J., Koutedakis, Y., and Wyon, M. (2012) ‘Ballet Injuries: Injury Incidence and Severity Over 1 Year’, Journal of Orthopaedic and Sports Physical Therapy, 42(9), pp. 781-790. Champion, L. and Chatfield, S. (2008) ‘Measurement of Turnout in Dance Research: Critical Review’, Journal of Dance Medicine and Science, 12(4), pp. 121-135. Clippinger, K. (2016) Dance Anatomy and Kinesiology. 2nd edn. Champaign: Human Kinetics. Coplan, J. (2002) ‘Ballet Dancer’s Turnout and its Relationship to Self-Reported Injury’, Journal of Orthopaedic and Sports Physical Therapy, 32(11), pp. 579-584. IADMS (2011) Turnout for Dancers: Hip Anatomy and Factors Affecting Turnout. Available: https://cdn.ymaws.com/www.iadms.org/resource/resmgr/resource_papers/turnout_for_dancers_anatomy.pdf (Accessed: 13.7.2018). IADMS (2011) Turnout for Dancers: Supplemental Training. Available: https://cdn.ymaws.com/www.iadms.org/resource/resmgr/resource_papers/turnout_for_dancers_exercise.pdf (Accessed: 13.7.2018). Negus, V., Hopper, D., and Briffa, N. (2005) ‘Associations Between Turnout and Lower Extremity Injuries in Classical Ballet Dancers’, Journal of Orthopaedic and Sports Physical Therapy, 35(5), pp. 307-319. Pata, D., Welsh, T., Bailey, J., and Range, V. (2014) ‘Improving Turnout in University Dancers’, Journal of Dance Medicine and Science, 18(4), pp. 169-177. Ramkumar, P., Farber, J., Arnouk, J., Varner, K., and McCulloch, C. (2016) ‘Injuries in a Professional Ballet Dance Company. A 10-year Retrospective Study’, Journal of Dance Medicine and Science, 20(1), pp.30-37. Sherman, A., Mayall, E., and Tasker, S. (2014) ‘Can a Prescribed Turnout Conditioning Program Reduce the Differential Between Passive and Active Turnout in Pre-Professional Dancers?’, Journal of Dance Medicine and Science, 18(4), pp. 159-168. Van Merkensteijn, G., and Quin, E. (2015) ‘Assessment of Compensated Turnout Characteristics and their Relationship to Injuries in University Level Modern Dancers’, Journal of Dance Medicine and Science, 19(2), pp. 57-62. Welsh, T., Rodriguez, M., Beare, L., Barton, B., and Judge, T. (2008) ‘Assessing Turnout in University Dancers’, Journal of Dance Medicine and Science, 12(4), pp. 136-141.